OTIS BOOTH LEGACY Business: Industry. Great-grandson of Times Mirror founder Harrison Gray Otis, Franklin Otis Booth entered Caltech at age 16, obtained an engineering degree, and later a Stanford M.B.A. He worked briefly for Los Angeles Mirror with cousin Otis Chandler, before joining his friend Charles Munger in a small real estate deal. Mr. Munger introduced him to Warren Buffett in 1963. Among other interests his investment in Berkshire Hathaway is well known. 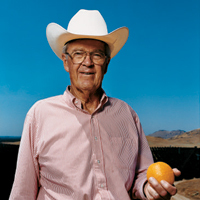 An avid outdoorsman Mr. Booth wanted his 9,000-acre Otis Orchards to be his legacy. ISA remembers Otis Booth and his great contribution to American business. We greatly appreciate and enjoy caring for the Booth family's staffing needs.